So you have a bird dog puppy, he is young, bold and intelligent and destined to be the next brag dog of your hunting group. You are already dreaming of next year’s trip to Kansas where your young prospect will be pointing quail and handling running pheasants like a champ. Most any book, video or dog trainer dealing with the development of young dogs will allude to the notion that birds make bird dogs, and this is most certainly the case. 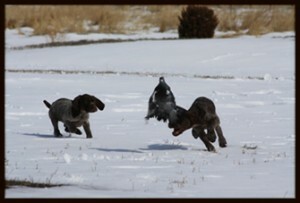 Remember, no scented dummy is going to teach your pup how to handle a running pheasant or pin down a covey of quail. So how does the amateur trainer with limited time and an even more limited budget expose his prospect to live birds? Even if your time and budget is limited, with a little creativity one can still introduce their prospect to birds and develop a world class bird dog close to home. The first key is finding a good place to run your pup. In his initial development it is important to develop a good front running dog and this can simply be accomplished by finding a large field, maybe a park or open space area where you can let your dog run. Encourage your prospect to stay to the front, if he swings to the rear or too far to one side stop and wait for him to return to the front before proceeding. These walks are extremely valuable to a young dog as they allow him to find his running pattern, explore the world outside, while at the same time making a connection with you as his handler. The next key is finding a field where you can expose your dog to live birds. Pigeons are a great way to keep your costs down, pigeon traps can be purchased commercially and many farmers and business owners consider the birds pests and would be glad to have you trap a few. Pigeons make great initial training birds, their scent is very game bird like and they can be easily dizzied and planted to produce points and flushes where you want them. Planting birds at pre-conceived locations in a training field teaches your dog to become familiar with the smell of game birds and develop his natural point. Later on in the game planted birds are the best way to fine tune your dog’s manners on game such as steadying your dog to wing and shot. Another option is to build or purchase a portable quail recall pen. Developing your own “covey” makes for great training. The birds can be worked and used multiple times and with a good recall system you can feasibly produce several good points in just a 15 to 20 minute training session. Plus you and your dog will learn the basic rudimentary fundamentals of a quail covey; how they feed, how they call to each other, how they move and what types of cover they prefer and how they depend on each other for survival. Whatever you do be sure to get that bird dog puppy on birds! More interactions with live game birds will only make him better. Perhaps the best option for your puppy is a combination of all of the above where he can learn many valuable lessons from ample time afield. Whether you are looking for help starting your first bird dog puppy or seasoned at developing bird dogs our goal at Valhalla Kennels and Gun Dogs is to provide you and your pup with the best training facilities and advice in the country. Give us a call today to come tour our kennels and get your pup off to the right start this season!